So/us Christianson and Annie Ramgren. So/us was born in Nesholm, Denmark, and emigrated to Canada in 1908. That first summer he worked for Lauritz Neilson in Clanwilliam, The following year Laura Jorgenson came from Denmark and they were married on July 24, 1909, in Clanwilliam. In partnership with Chris Neilson he bought a farm but later chose instead to open a creamery in Erickson. At that time a record book was given to each cream shipper and this book went with the can of cream. It was then returned with the entry of the weight and butter fat test. For a time someone drove around the district to gather the cream. Sofus and Laura had one son who passed away as an infant. At Erickson they purchased a farm, S.W. 33-17- 18W. He was active in the forming of the Farmer's Elevator in Erickson, so much so that he mortgaged his land to finance a trip to Denmark where he studied the principles of the organization of a co-operative. He eventually lost his land through this move. After leaving Erickson, Sofus managed creameries at Riverton, Beausejour, and Miniota. During the years 1930 and 1934, he was Butter King of Canada. He also won cups and trophies in Manitoba. In 1949, Sofus and Laura moved to British Columbia where they later celebrated their 60th wedding an­ niversary. Sofus passed away October 23, 1972. Laura still resides in British Columbia. Peter Christopherson, son of Hans and Christine Christopherson, was born on a farm near Faxe, Denmark about 100 miles from Copenhagen in September 26, 1863. At the age of seventeen years, Mr. Christopherson emigrated to America, arriving by boat to New York, U.S.A. From there he went on to St. Paul, Minnesota, where he found employment driving a street car drawn by horses. He lived and worked in St. Paul for 3 years before leaving and arriving in Winnipeg by train. In Winnipeg, Peter ran a hotel for his Uncle James (King) Hemmingson. Having Peter run the hotel for him, Mr. Hemmingson left Winnipeg and involved himself with the settlement of the Scandinavian immigrants on the northeast shore of Otter Lake where the immigration house was. Hemmingson then started up one of the first lumber sawmills in that district and a few years later Peter Christopherson followed him and worked with his Uncle in the lumber business. Peter Christopherson's wife, Taletta Serina Orton was born July 20, 1871, in Soude, Norway, daughter of Christ and Tabor Orston. Her father was a baker in Norway. In 1858, Taletta's mother and father and a baby daughter sailed to America where they settled in New Lisbon, Wisconsin. There two more daughters were born to them. One of them Ingeborg, married Ole Rod of Grafton, North Dakota, who was one of the early members of the States Legislature. The Ortons returned to Norway. When Taletta was fifteen years of age they made the journey to the U.S.A. again, this time to Grafton, N.D. Taletta made her home with her sister, Mrs. Rod, in Grafton, N.D. while her parents and an older sister, Mrs. Wetteland, proceeded on to Danvers, Manitoba, to a newly settled Norwegian settlement. There they filed on a homestead and made their home until the end of their days. Peter Christopherson first met Taletta in Danvers, Manitoba, while she was home visiting her parents and sister. Peter being a determined young man knew that the pretty young girl from Norway, whom he fill in love with, was going to be his wife. Taletta wasn't so sure she wanted to take Peter on as a husband, but said "his good looks and singing won her over." 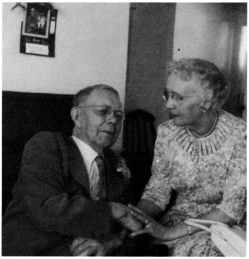 On January 2, 1892, they were married in the All Saints Church near Clanwilliam, with Rev. E.A. Gill of St. Marks in Minnedosa officiating. They were the third couple to be married in the All Saints Church.